I can count no less than a dozen apps on my computer and phone for note taking and personal organization – Reminders, Notebook, Evernote, OneNote, Calendar, ToDoist, Trello, Asana, Email, Slack, Skype, etc. What happened to just using plain old paper? In college, the first thing I bought for the beginning of my semester was my planner. I needed to be able to plan out my semester, from what courses I was taking to the milestones for each course that usually amounted to papers and tests. I worked nearly full time while going to school full time so I also needed my planner to sort my work schedule around school. And, because I wasn’t busy enough, I needed to plan my volunteer activities in student associations and sports clubs around the rest of the time I had left. Maybe not every person is “super organized.” I’m probably above average. But they invented college planners for a reason – because this kind of organization was required to help you progress through your semester and meet deadlines. Why did we lose this kind of discipline immediately upon graduating from the academic to the professional world? If you haven’t heard of a Bullet Journal, it’s an analog system designed by Ryder Carroll for rapid note taking and future planning. Since his creation of this “movement” for traditional to-do lists, dozens of bloggers and designers have expanded the system to include spreads for planning or managing anything from monthly bills, to fitness goals, to mental health and mood disorders. What’s amazing about this system is that it is entirely a blank slate for you to design and organize yourself into a method especially for you. You can try a weekly spread and if you don’t like it, you can try a different format next week. Don’t like to track things on a weekly basis? Fine, use a daily format. It’s entirely up to you. 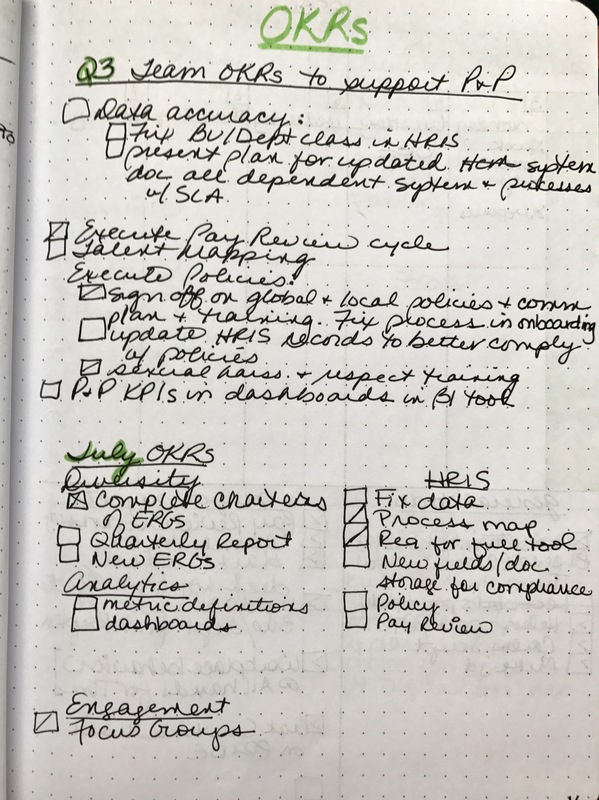 Use a key to identify how to mark when an item is a task to still to be completed, when it’s started, when you have to migrate or schedule it into the future because it’s not complete, and when it is finally completed. Use time-based or category-based grouping – the most popular is a 6 month future log, a monthly spread, and a weekly spread. Some people use daily spreads on a part or full page. I’ve found pairing your key with long note taking in big multi-hour meetings is an excellent way to quickly compile your action item list. I’ve been using a bullet journal for my personal and professional life for just over a year and I’m going to give you a few tips on how you can implement a system like this to make you a better manager. The business world changes rapidly. Remember it’s just paper. If something changes, you can cross it out and write in a new objective. As long as you communicate you can make changes and track this anyway you like. A benefit of this kind of behavior too is actually seeing how many times your guidance has been changed in a quarter; it can speak to deeper problems in organizational communication or leadership. Develop a weekly plan – I always have weekly team meetings and, if I can, weekly or bi-weekly one-on-ones with my team members. I’ve found that to keep “flow” and process on the big ticket projects it’s what people say in a short and informative 5 minute report that is what matters, rather than them wasting time on extensive status documents that will take them an hour to write out and perfect. If you need a detailed document for performance reviews or a project plan for a super large team, of course you should do that, but to keep an agile direct reporting or leadership team humming like a machine, I like to hear the high points and ensure that all the team members are connecting the dots between each other’s work to accomplish our goals together. 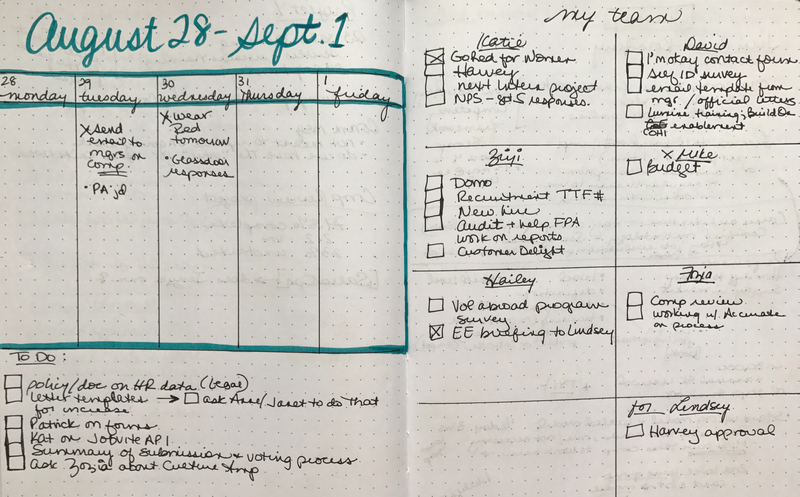 I live and die by my weekly spreads as a bullet journal user, so my weekly contains key meetings, events or milestones in a calendar format; my to do list; but most importantly I track from my direct reports the major progress on their projects week to week. I refer back to the previous week as they give their weekly update and check off that what they said they were doing is completed. Did they tell me 3 weeks in a row they were working on the same project and I’ve migrated it 3 times on the spread? Well, that’s a problem maybe of focus or workload. I should see that as I review my quarterly and weekly trackers and ask why. With a very large team of direct reports, this may not be a solution for you. But you should easily be able to handle the high points of a team with at least 6-12 direct reports this way. Imagine the possibilities if you could also teach your leaders to manage their own staff this way? At the end of the day simply using and referring back to quarterly and weekly spreads gives you a tool to keep things moving and, at the same time, notes to facilitate performance reviews or more detailed one-on-one discussions to resolve conflicts or celebrate success. Looking for bullet journal inspiration? Check out my Pinterest board. Previous How do we build happiness at work?